One of the best parts of childhood are the little discoveries. Those moments of finding something new, cool, interesting or exciting. Feeling like the first person in the world to ever realize that something so cool could happen. I love these moments! 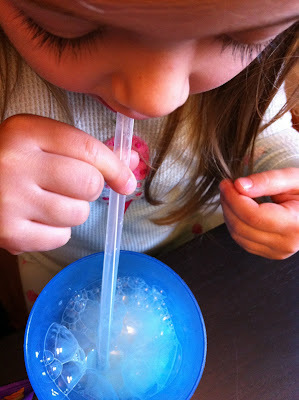 The other day The Bee had one of these moments when she discovered that you can blow bubbles in milk. She was sitting at the table in the kitchen drinking milk through one of the Magic Milk Straws she got for the holidays. The Magic Milk Straws are pretty cool in themselves since they seem to magically make plain milk taste pink and if you read Charlie and Lola books you know how important pink milk is. However the straw was not what had her screaming in excitement for me to come see, it was the bubbles. She was so excited about how her cup was almost overfilling with bubbles, to which I could so clearly hear my mom yelling at my sisters and I to stop blowing bubbles in our milk, and had to overcome the immediate mom urge to say the same thing. She then asked how come you blow bubbles in milk? I had no idea why, so of course we had to check it out on the Internet. It turns out it is the proteins in milk that cause the bubbles. We even found a cool experiment, which we didn't try, but sounded like fun. They are pretty cool! Do they like them?